To wind down at the end of the day you are spoilt for choice with dining options! Whether you want a fine dining experience, coffee by the fire or a cold beer while catching the rugby, one of the three facilities available on site will be sure to appeal to you. Nothing beats a cold beer and the company of likeminded locals and travellers at the end of the day. The tradition of the welcoming Inn is a long and comforting one. Emberz Bar offers the perfect blend of a friendly welcome and casual dining in the comfort of a large, warm room embellished with native timbers, stonework, local artists’ work and an ambient fire. The perfect spot to unwind and relax, Emberz at Ascot offers a casual alternative to the fine dining restaurant with an extensive menu that is perfect for your lunch date or laid back dinner. Enjoy a selection of beers, wines and great coffee. There’s nothing quite like an exquisite meal with a perfectly matched wine to top off a great day. Experience delicious New Zealand cuisine and fine dining quality at Ascot Park Hotel’s superb hotel restaurant. Local, southern hospitality combined with world class service, Emberz will satisfy the most discerning food traveller. Ideal for a sunny afternoon long lunch or dinner. 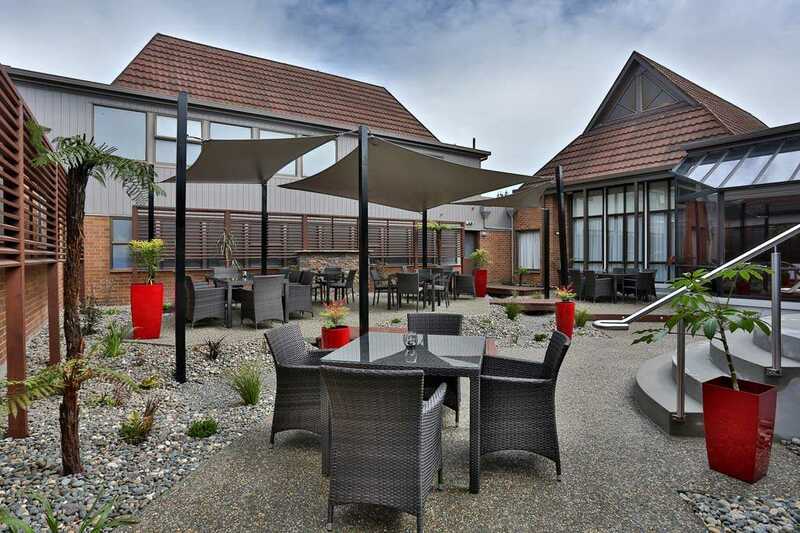 Come and enjoy Southland's famous twilight evenings in our beautiful courtyard dining area. Whether it be fine dining, a laid back lunch or coffee and cake with an old friend, come and experience the ambiance of Emberz Courtyard. Nestled alongside our Emberz Restaurant, set amongst native shrubs and water features, Emberz Courtyard provides a fantastic area to enjoy the sunny afternoons and twilight evenings. The Ascot Sports Bar is a great place to catch all the games and enjoy the highlights over a beer with likeminded travellers and locals. You can enjoy a drink, place a bet at the TAB, or shoot some pool. The Ascot Sports Bar offers a wide selection of light meals and there is a bottle store located in the bar for your convenience - it's the perfect place to visit after a long day of conferencing. Think you’ve got the luck of the Irish? The Ascot Sports Bar is also equipped with a gaming lounge including 18 pokie machines.